raised outlines are the result. The surface of the puzzle is higher than the puzzle base, which helps the user feel the different levels and slide the puzzle piece into the correct position. The pieces themselves, though they lack pegs, are chunky and easy to grip. Also, holding them by the edges gives a better impression of their shape. Three domestic animals are used in this collection ie. dog, cat and cow. 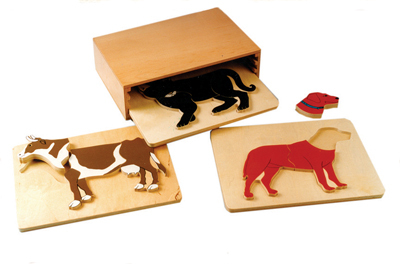 Each animal is depicted individually and is designed to be stored in the pictured cabinet. 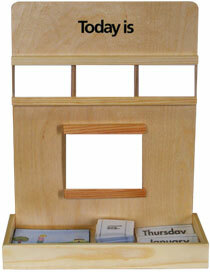 Includes- Three Puzzle Cabinet and three jigsaw puzzles.